We live in a world...where Christians are more likely to be passive spectators than active participants in the mission of God. That’s NOT holy living is it? The Christian world of today, expects preachers and teachers to minister to them... to“tickle their ears” and speak only in gentle tones with soothing words laced with overwhelming and affirming love (2 Timothy 4:3-4). They desire to be the “objects” of the Church’s ministry rather than partners in the ministry of saving souls. People love to be passive spectators rather than active participants in the mission of God. Passive means no responsibility and no accountability for what you personally are doing for God. The attitude is prevalent across all of Christendom: Outreach, evangelism, it’s always someone else’s responsibility – the preachers, the elders, the leadership in the congregation. We have to decide whether we’re going to be part of that ineffective [unholy] system or whether we’re going to break free from that system. God has filled churches with redeemed and spiritually gifted people to accomplish His agenda in the community, to see His gospel preached, and to see people shown the real true love of Christ. It’s shameful to squander such talent by making ourselves the center of attention. When preachers, pastors and staff do for people what God has called His people to do, everyone gets hurt and the mission of God is hindered. The problem is the prevailing church system teaches its flock first to pay, then pray and then stay out of the way so you don’t interfere with the “lather, rinse, repeat” formula that defines the ineffective church of today. It’s time to evaluate what we have been doing, all the while patting ourselves on the back, thinking we've got church right. It’s time to break free from the ineffective system. 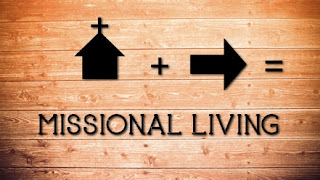 Part of living holy lives is to bring God glory (1 Peter 4:11). We need to change the way we present everything we call “doing church” so that what we are doing from worship in the assembly to individual evangelism brings glory to God. How can we do this? STOP being satisfied with the status quo of the church as a superstore dispensing worship and programs that entertain us and attempt to educate our children. Instead, change your perspective –– see church as the “equipping center for evangelism” God intend it to be. The results will be a bit unnerving. Some people won't like it and may even leave the fellowship of the congregation, but God will get His due glory and He will grow the flock. Holy living is a life lived in passionate pursuit of the qualities of God. In what direction are you living... towards Him and His Mission or towards your self-centeredness? Give that some thought.